The display of robotics at this year’s Consumer Electronics Show reinforces the prediction that there will be a growing presence of robots in American households. Now, you may be imagining humanoid type computers that look like they should be in a Styx music video, but I’m referring to domestic bots that display advanced (and often smart) automated technology. Matter of fact, robots are already making it easy to surrender household chores that we hate to do. 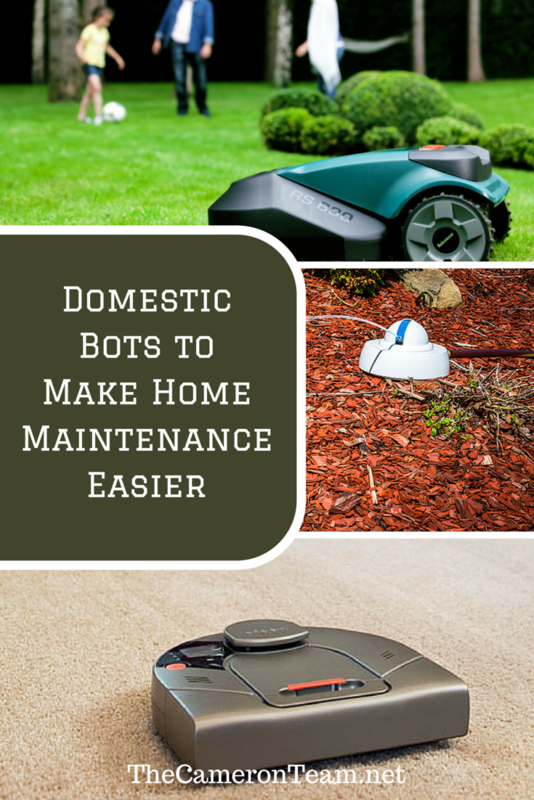 Many people are familiar with the Roomba, one of the first mainstream domestic bots. It would bounce around the room aimlessly vacuuming up dirt and providing free rides to the household feline. This was great if you had wood floors and a nice open floor plan, but when the battery died, you were forced to carry it to the base to recharge and it wasn’t very good at getting the dirt located under furniture. Now, there’s Neato. This domestic floor bot scans the room before it vacuums in order to plan out its path. This means less bouncing around. It also has a large bin for holding dirt and is square in order to get into corners and against walls. When the battery gets low, it heads to its base to charge up and then returns to where it left off. There are also sensor strips that you can lay down to prevent it from running into toys and other items placed on the floor. There are different versions of Neato and they start around $300. Love all the fun of grilling, but none of the cleanup? Take a look at Grillbot. You can place it on a hot or cool grill and its rotating bristles will clean it for you. When it’s done, it beeps to notify you. It runs on D batteries and costs around $129. Cat lovers rejoice! Cleaning the litter box can be as easy as emptying the trash every few days. The Litter-Robot is a cat-activated litter box that sifts the clumps into a lined tray in the bottom of the unit, which helps to eliminate odors. The only downside is the size of the unit, which is around 29” high x 22” wide x 24” deep, which may not work for apartment dwellers. Still, it’s more convenient than other supposed automated litter box cleaners. From the creators of the Roomba comes the Scooba Floor Scrubbing Robot. It starts by sweeping up loose dirt and pre-soaking the floor. Then, it scrubs and squeegees the floor, and ends its cleaning cycle with one more round of squeegeeing to make sure the floor dries quickly. It cleans with water or a patented floor cleaner. The base it sits on when not in use acts as a charger and dryer to help reduce microbial build-up. iRobot claims the Scooba washes away 99.3% of common household bacteria, and it has a 20-minute or 40-minute setting. Downfalls? It’s round (see Neato) and costs about $600. However, it works on many flooring types and helps cut down on your household work. Free up your weekend by letting Robomow take care of your lawn care! This handy robot comes in multiple versions depending on the size of your lawn. It’s designed to manage many types of terrains and will even move between different zones of the yard if there is a grassy strip or path. You first have to train the robot on the boundaries of your yard, but after that you can let it go on its own. It has a rain sensor that lets it know it needs to return to its base and will only continue trimming when the weather is clear. It will also return to its base when its battery is getting low. Afraid to let it work alone? The mower also has an app to let you control it from your phone. Units start in the low $1,000s. Save money, water, and your plants with Smart Droplet, the intelligent sprinkler. Hook Smart Droplet up to your hose, connect it to your home Wi-Fi, tell it which plants are located in your garden, and it will make sure that they get watered according to their individual needs. Smart Droplet draws its intelligence from a large database of weather stations, soil samples, and plant information to make sure your plants are well taken care of. If there is a high chance of rain, it will delay watering. With a 40 psi hose pressure, it will reach 30 feet or approximately 2,700 square feet, and can be controlled with a smartphone, tablet or website. Its retail price is about $300. Here’s another domestic helper from iRobot. Looj is your gutter cleaner. Set it in your gutters, turn it on, and let it go. It handles leaves, dirt and sludge all on its own, and it’s powerful enough to make it through bad clogs. It does 30 feet in just 5 minutes and you control it from its detachable handle which is also a remote control. The price of Looj comes in around $300. This neat desktop robot isn’t designed to physically maintain your home, but is created to help you stay on track with your daily schedule. Jibo can act as a personal assistant reminding you of tasks and appointments. It also recognizes family members and can be programmed to deliver messages. It has a built-in camera, which makes it easy to take pictures and video chat. Jibo pivots, so it can follow you as you move around the room. As a bonus, it tells stories that are sure to delight children. Jibo isn’t yet ready for sale. They’re currently fulfilling all orders made when the developers crowdfunded the robot, but the Jibo store is due to open in 2015. When will people be ready for robots resembling and mimicking human beings? That’s difficult to put a time limit on, but the technology exists. For now, home owners can take advantage of these handy helpers. The bigger, more advanced robots obviously have a larger price tag, but the amount of money you can save from household chores being planned by a computer can make up for it in the long run.